Are you a wizard on ResRequest? How many tricks do you know? Many users are not always aware of all our handy features and top tips so we’ve highlighted a few of our snazzy features from frequently asked questions and noted some helpful hints from our support consultants. Here are some of our most popular features. Are you using them? Our Ops chart is by far the most customisable and useful report for lodges to help with all parts of your operations on the ground. Display logistical arrangements such as arrival and departure times of flights and which guests require transfers each day. Run this report every Sunday for the week ahead to streamline your planning. View which rooms are occupied or available per day and reference the internal notes for guest preferences or special arrangements for the room and what times the guests will be arriving or departing. Generate a report for the kitchen crew to calculate how many breakfasts, lunches and dinners are required that day/week and how many adults and children to cater for. This is really useful for the meet & greet team to know exactly who they are expecting, what nationality the guests are and how many people are in the group. The report can be set up to include special memos, such as a guest’s birthday so that the team can create an extra special experience for them. These are just a few examples and there are many more possibilities. Get in touch with our team to help customise the chart to your liking. 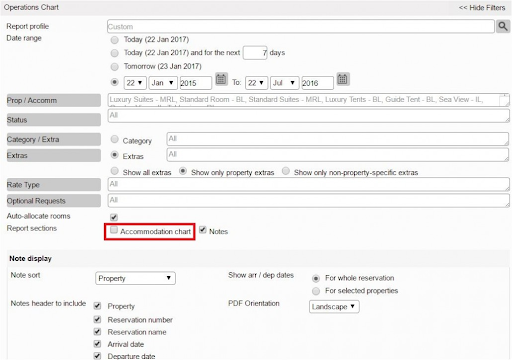 If you’re not interested in viewing rooming and just want to know basic details about which guests are arriving, their names or what extras have been booked, then deselect your Accommodation Chart in the report filter section. The Rooming calendar is your hub for Property Management as most of the lodge processes are governed from here. Navigate to the Rooming calendar through Property > Rooming Calendar or even set the Rooming calendar as your landing page. The Rooming calendar lists ‘Unallocated Reservations’ in a table below the calendar. These are bookings that have not been allocated rooms. Bookings that have been allocated to rooms are displayed as coloured blocks in the calendar in the row of the allocated room. As soon as new bookings are made they will automatically appear in the ‘Unallocated’ list. Each booking has a ‘Res Details’ option where you are able to have a quick view of the Guests contact details and the Financial information of the booking. To activate any of the functionality, the bookings (either allocated or unallocated) must be selected (highlighted in green), the buttons in the tab above the calendar then become active for use on the selected reservation. 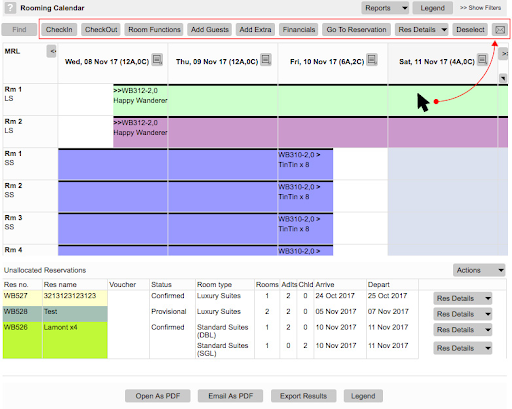 Within the Rooming calendar there are multiple day reports you are able to pull to help with daily logistics and planning at the property. 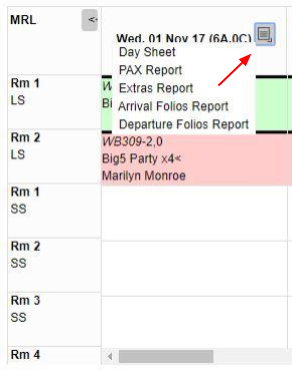 Day Sheet – Here you can see the breakdown of the Pax Analysis, Reservation Summary, Rooming Plan, Request and Extras for a particular day. This report may be used to track transfers too. PAX Report – Here you can see a breakdown of how many guests are arriving, departing or in-house on a specific day. Extras Report – Here you can see all Extras booked for that day. This report may be used to track transfers. Arrival Folios Report – This report lists all folios of guests arriving on the selected day. Departure Folios Report – This report lists all folios of guests departing on the selected day. But wait, there’s more…We have a new and improved rooming calendar coming soon, so watch this space! 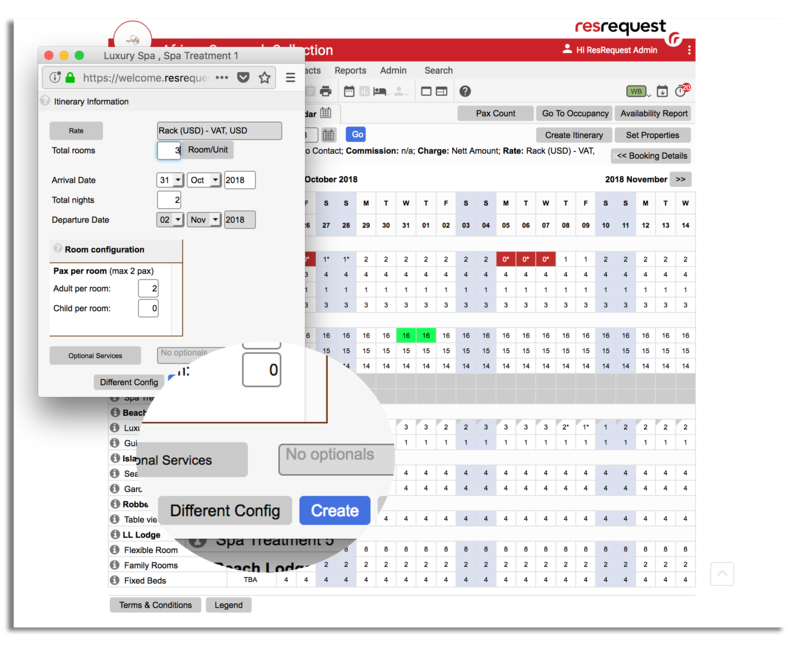 ResNova is our booking widget which enables you to embed your ResRequest availability and rates anywhere on your website. It offers two formats so you can show your information in a calendar matrix or a quick search…or both! You have the option of just showing availability, or enabling bookings, and even linking up to a payment gateway to enable payments during the booking process. 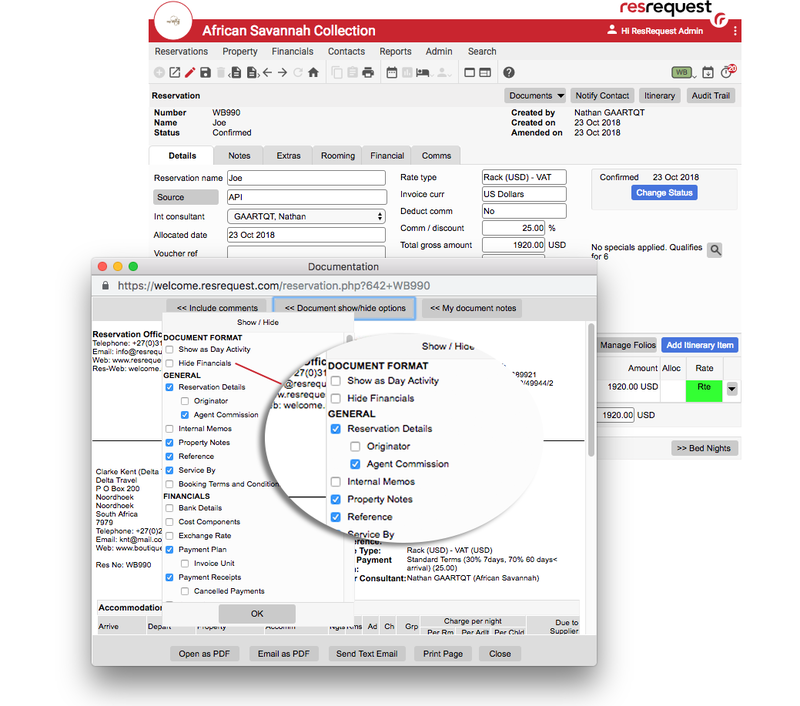 All of this is seamlessly integrated to your ResRequest system. Mobile compatibility for ResNova is also now here! Whether your customer uses a mobile or desktop, booking your hotel is now super easy. Your ResNova widget will automatically adjust to your user’s device! PayGate can be used as a payment gateway for ResNova bookings. Do you have your special ResRequest tricks that you use all the time or a few quick shortcuts that make you a master of ResRequest? We’ve asked our support consultants for their top handy hints. How many of them do you already use? Add *@* to your Guest History report email filter to “find all your guests with email addresses, great for mailing lists. You can do this by using the document show/hide options if you want to use the document as a voucher for guests/agents. 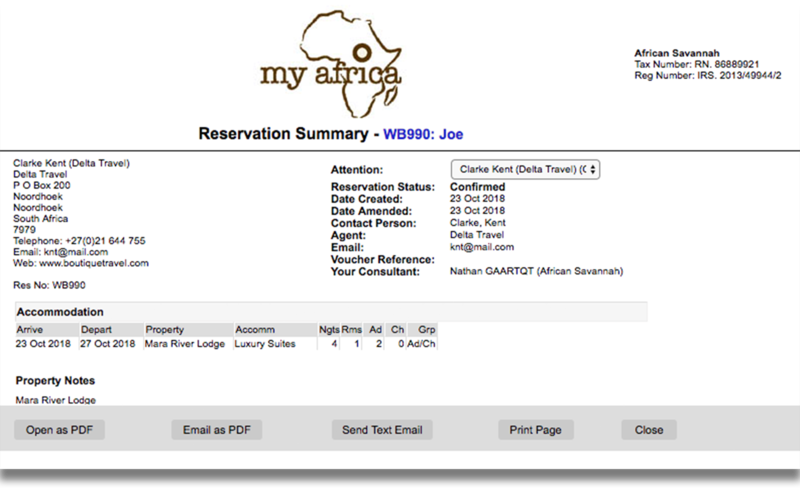 Add keywords such as “lodge”, “safari, “luxury accommodation” into the Keywords field, on the Internet Marketing tab of your system defaults (Admin > Setup > Defaults) to increase your footprint on online searches. By using the “different config” option, in your itinerary creation popup. You can add multiple combinations to a single itinerary, all from a single popup screen. 5. Narrow your search for contacts by using an *. 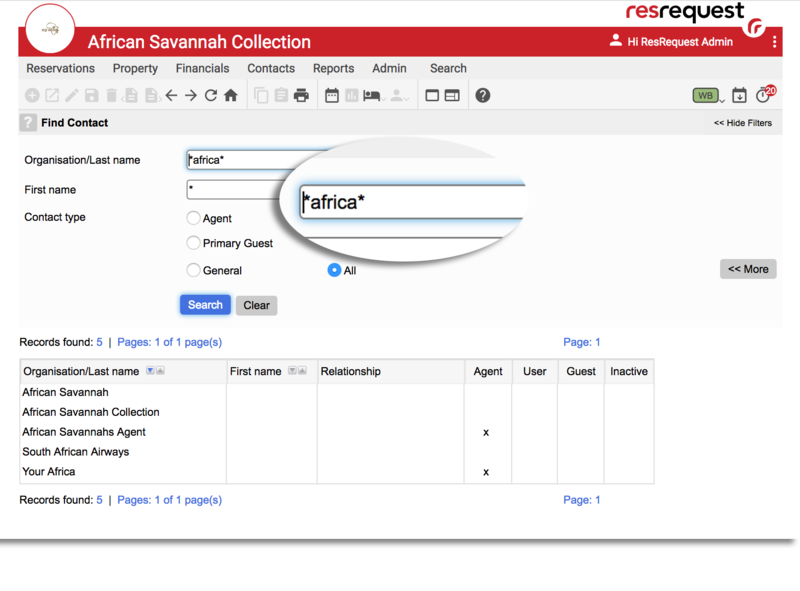 Example: You want to search for an agent with “African” in the name. Go to Contacts > Find contact > in the organization field, type in: *African*. You will then see a list of all the results, showing “African” in the name. If you can’t get enough of these helpful tips, we have some more in our quick tips and tricks blog. Remember if you are ever stuck or need a hand, head over to our Learn Online support site available and our functional support call centre crew are only a request away. 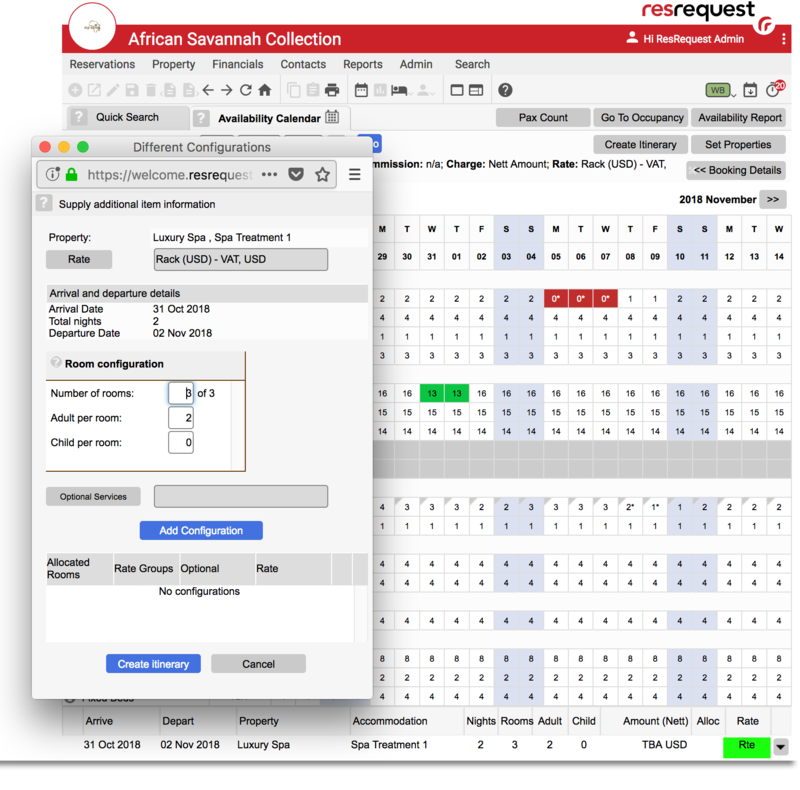 We hope that these tips will save you time and help you get the most out of your ResRequest system!